well….. let’s admit it: summer is sort of almost getting close to being over (??!). there’s still a month left which is good but I went to jo-anns today and they had all their fake halloween leaves and stuff ready in the front and I almost went into cardiac arrest. anways, if you’re anything like me, you’re probably finding it hard to find the motivation to do… anything (especially things like studying for the ACT or PSAT or subject tests or even getting started on summer homework… lol). the other day I was going through this sort of funk… aka it was like 100 degrees and I was slowly degenerating into a blob on the floor. What to do???! well I’ve learned over the years that baking stuff is usually a good use of my time! So I started flipping through our smitten kitchen cookbook and narrowed my choices down to either lemon bars or some sort of snickerdoodle-blondie thing. To be honest the snickerdoodle things looked pretty dang good but I didn’t think I’d be able to eat a whole pan of them in this weather without feeling even more lethargic than I already do haha so…. even though it went against everything I stand for…. I decided to make something.. lemony! It just seemed like the right thing to do. I mean citrus is refreshing right. And zesty. I figured that’s the kind of stuff normal people make in the summer so might as well give it a go. so first line an 8×8 pan with parchment and butter! also don’t be like me!! so first pulse all the dry ingredients together in the food processor! and pulse until it looks like this! pour it into the baked crust! just stick it in the fridge for a few hours and dump as much powdered sugar as you can fit on top… it’ll end up looking fine! see!!! totally acceptable! I was kind of worried that it would taste weird because of the whole lemon in there (??) but I totally couldn’t taste it! It was super creamy and sweet and tart and I really liked it actually (even though I’m usually anti-fruit desserts haha)….. when I told bubby I was making lemon bars he made a pukey face but then he ate like 5 of them so if that doesn’t convince you to make these I don’t know what will!! Place a rack in middle of the oven and preheat your oven to 350 degrees. 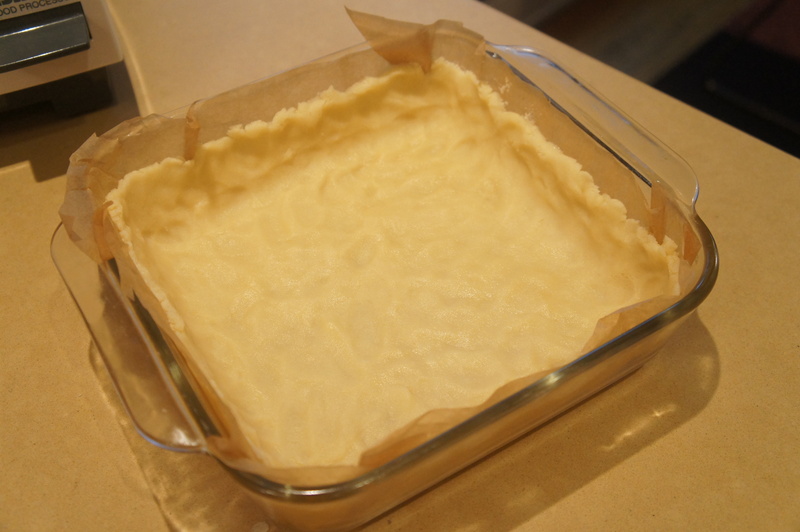 Cut two 12- inch lengths of parchment paper, and trim each to fit the bottom of an 8- inch square baking pan. Press the first sheet into the bottom and up the sides of your pan in one direction, then use the second sheet to line the rest of the pan, running it perpendicular to the first sheet. Lightly butter or spray the exposed parts of parchment. Set the pan aside. Make the crust. Blend the flour, sugar, and salt together in the work bowl of a food processor. Add the butter and pulse until the mixture is powdery, but if firmly pinched, will hold together. 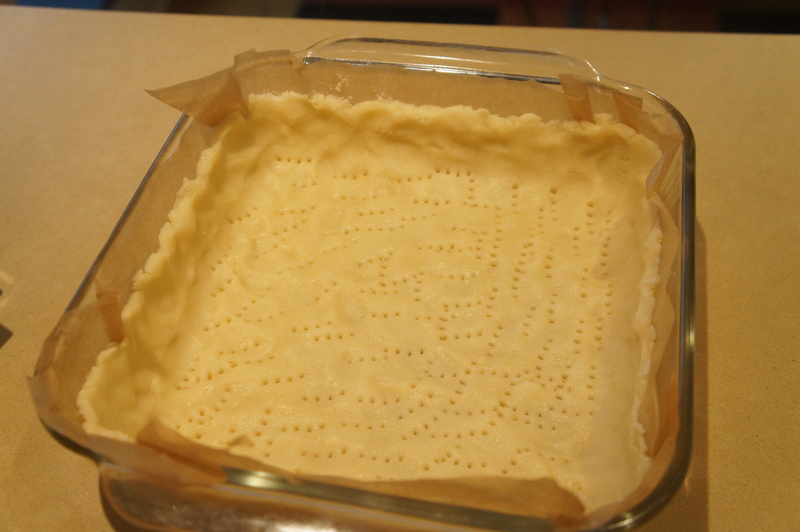 Turn the dough crumbs into the prepared baking pan and press the dough evenly across the bottom and about ½ inch up the sides. Prick the dough all over with a fork and bake for 20 minutes, or until lightly browned. Should any parts bubble up, gently prick them again with a fork. Leave the oven on. Cut your lemon into thin rings and discard any seeds. Toss the lemon rounds in the bowl of your food processor, add the sugar, and run the machine until the lemon is thoroughly puréed, about 2 minutes. Add the butter and again run the machine until the mixture is smooth, scraping down the sides of the work bowl as needed. Add the eggs, cornstarch, and salt and pulse the machine in short bursts until the mixture is evenly combined. Pour the lemon mixture over the crust and bake it for 35 to 40 minutes, or until the filling is set, slightly jiggly and a bit golden on top. Let the pan cool completely on rack or in the fridge. Gently cut around the outside of the parchment paper to make sure no sides have stuck, then gently use the parchment lift the bars onto a cutting board and cut into squares. Before using your lemon, you have to do a test to make sure the white part of the skin isn’t too thick. (if so, the bars may be too bitter). Cut your lemon in half- is the white part of the skin especially thick? If the widest part of the white is ¼ inch thick or less, your lemon is good to go. If any part of it is thicker than ¼ inch, however, remove the skin from half the lemon- a little less skin will help to even out the flavor! Yum! Love the ease of using the whole lemon and just the food processor!